Just read that Technics is going to start making their iconic turntables again. i bet they use RCAs but if smart they will provide a multi-pin in parallel. Where was all this vinyl love when I was selling preamps? I suspect that like Teac's new TT the Technics low-end model will have an on-board preamp with line-level RCAs and USB. I'm not sure they ever stopped making them did they? It looks like they OEM'd them to about everyone else in the biz. Maybe I'll feel some vinyl love soon. Just figured out that my CoolEdit FFT tables are dedicated to 44.1 kHz. I agree with ricardo about the FIR filter limits. But with a 44.1 K file it doesn't sound weird like a 96 kHz file and 44.1 kHz tables. Looks like DiamondCut 8 uses another topology than FIR. I may try out the demo. mediatechnology wrote: It's the same problem attempting a true balanced connection with RCAs and moving magnet carts. The balanced inputs work better with RCAs but only if the shield is grounded. Try to float the shield and it hums. The popularity of the SME made RCAs Golden Pinnae. And they used the worst type of RCAs too with the long pin ... gold plated of course. They might have also mucked up the 'traditional' earthing system. 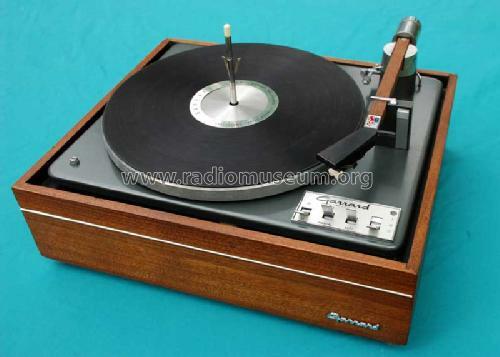 Traditional was a separate earth wire for the arm & turntable metalwork led to a screw on the preamp. It's not that all FIRs are EVIL. It's cos most are Linear Phase which is truly EVIL. Its the easiest way to design FIRs and most DAW people haven't taken Digital Filters 101. Analogue stuff is usually Minimum Phase ... Phase as God intended. Among the Holy properties of Minimum Phase is that if you EQ a Minimum Phase response with another Minimum Phase response, both the Amplitude AND the Phase response become flat. Practically all electromechanical/acoustic devices are Minimum Phase. (I can quote only 2 examples in speakers which only proves the rule). Analogue circuits are usually Minimum Phase too. You have to go to a LOT of extra complexity to do otherwise. The same goes for the common and easy methods to do IIRs ... most classic Bi-quads etc are Minimum Phase cos they try to emulate analogue stuff. Last edited by ricardo on Fri Sep 11, 2015 5:54 pm, edited 2 times in total. Mine is 5 wire plus TT frame ground. I recorded a RAW file 16B/96K in CoolEdit. Opened the file onanother machine in DC8, did E-Z Clean, applied RIAA via the Virtual Phono Preamp, downsampled to 44.1 and encoded an mp3 using DC8's Lame plug-in. The RIAA filter sounds normal. According to the whitepaper posted earlier it has a good approximation to analog RIAA phase response. As John has pointed out I should use my Inverse RIAA to check it. DC8 seems very user friendly. This particular transfer was pretty clean so there wasn't much de-clicking needed. mediatechnology wrote: What is SME? HA! That dates you as a young whippersnapper who wasn't around in the Golden Age of Vinyl. SME 3009 series II. Touted as the 'best pickup arm in the world' .. as were all previous & subsequent versions. HA! That dates you as a young whippersnapper who wasn't around in the Golden Age of Vinyl. The first LP I bought as a teen was Crosby, Still, Nash and Young, Deja Vu released in 1970. Played on my brother's Garrard Lab 80 from Radio Shack through the Panasonic MF-800. For awhile I had an AR turntable but I don't recall what happened to it. I thought SME was some kind of business degree like an MBA. That's how things usually get messed up badly. So SME ditched 5 wire? IIRC the AR turntable was belt drive, and could be run backwards (?) for listening to satanic messages. My first turntable, probably mid '60s was a Lafayette Radio kit. I had to drill-cut out some holes and mount it to a piece of plywood. I remember getting a small couple watt stereo amp for Christmas one year that used 4 tubes. You could see glowing gases inside the tubes that danced around with the music. My first speakers were 10' full range with tiny alnico magnets. the boxes that the speakers came in, became the crude DIY baffle/enclosure. Earliest album I recall was west side story, so early-mid '60s. My dad was a recording engineer (RCA) and his personal collection had a lot of '78s and he would even cut lacquers for us kids if there was something we really wanted. Oddly I recall some popular TV show themes. Kids were easy to entertain back then. I use an SME 3012 on the lathe. It's the 12" version of the 3009. It's the standard tonearm on a Neumann lathe. They made a bracket for it. There were also brackets for a Grace, which was a Japanese SME knock off of high quality. Also an Ortofon 309. The SME uses a strange four pin connector. I only know it as the SME connector. The mating connector has a tab that mates with the tone arm frame and wand. After much hand wringing I am replacing the SME connector with a DB9. With this phono preamp, since different heads can be set up for different cartridges it makes sense to have standard connectors for everything. I got a D Sub installed on the SME 3012 but it turned out to be a DB15. The holes lined up perfectly. I had to use some washers as spacers to use the screws and spacers that were part of the SME. You can't use the big SME sleeve that slips over the exposed connector on the tone arm because the mating DB15 shell is too big and the sleeve is too long. Other than that it's great. I have a few refinements to make. I will use long M3 studs with threaded standoffs for the DB15 cable connector to screw into. I will also make a sleeve to cover the exposed tonearm side connector. If you have an SME with an ancient connector I'd recommend this. It permanently alters nothing so it can alway be put back to stock if desired.